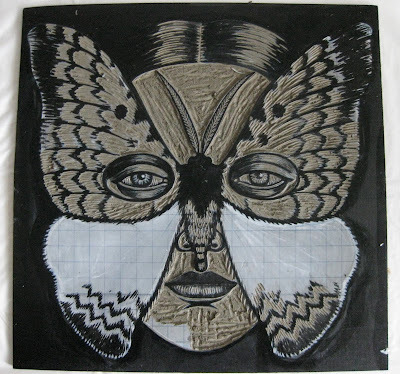 Genesis of Chenuala heliaspis Moth Mask linocut, 30.5 x 30.5 cm. On Friday, 5 March, Gallery 101 held its final celebration after nearly 20 years of being a vital part of Melbourne's cultural life. Director Dianna Gold, Gallery Manager Martina Copley and Gallery Assistant and Media Liaison Officer Cate Massola were all a pleasure to work with, and I hope our paths will cross again one day. 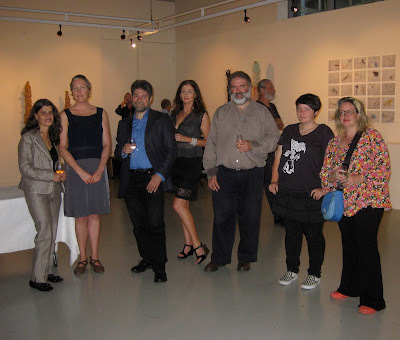 Many artists whose work I admire enormously, including Judy Holding, Heather Shimmen, Tim Gresham, Christopher Heathcote, Deborah Walker, and Angela Cavalieri, were exhibiting artists at Gallery 101. A number of us are also old friends, which added very much to the feeling of being part of a family. The Gallery will close its doors on March 13. 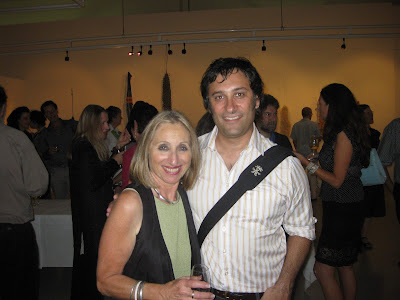 Top: Director of Gallery 101 Dianna Gold with Vincent Alessi, Artistic Director Latrobe Museum of Art. Lower: Angela Cavalieri, Martina Copley, Steven Kafkarisos, Lisa Barmby, Tim Gresham, and Grace with her mother Heather Shimmen. 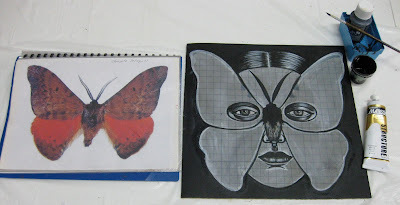 The Monarch butterfly (Danaus plexippus) is a milkweed butterfly (subfamily Danainae), in the family Nymphalidae. Although it originated in the US, it has been found in New Zealand, and in Australia since 1871, where it is called the Wanderer. In Europe it is resident in the Canary Islands, the Azores, and Madeira, and is found as an occasional migrant in Western Europe. 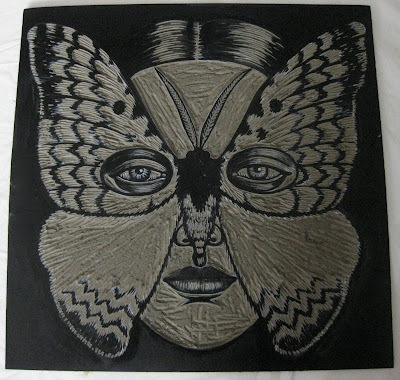 Its wings feature an easily recognizable orange and black pattern, with a wingspan of 8.9–10.2 centimetres (3½–4 in). (The Viceroy butterfly has a similar size, color, and pattern, but can be distinguished by an extra black stripe across the hind wing.) Female Monarchs have darker veins on their wings, and the males have a spot called the "androconium" in the center of each hind wing from which pheromones are released. Males are also slightly larger. 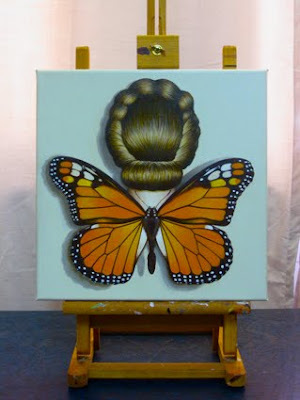 The Monarch is famous for its southward migration and northward return in summer in the Americas which spans the life of three to four generations of the butterfly. 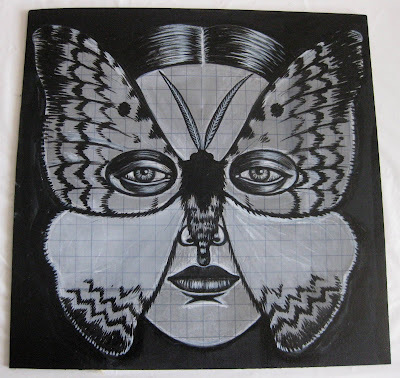 Image above: Monarch Butterfly Winged Woman 2010, acrylic on linen, 36 x 36 cm. The artist's studio, March, 2010.